The first thirty-six hours of AO-92’s life in orbit have seen a flurry of activity as the AMSAT Engineering and Operations teams walk through an extensive checklist of tests required to check the functionality of the satellite’s on-board systems. The first crucial test came on the initial pass over AMSAT command stations hours after launch. Around 15:00 UTC on January 12, 2018, AMSAT command stations successfully issued the first command to the satellite, changing it from the initial Beacon Mode to Safe Mode. The switch to Safe Mode allowed the collection of min and max data for the various telemetry values. As AMSAT Engineering continued to evaluate the data received, the decision was made to test the U/v FM transponder briefly on the evening passes over North America. At approximately 01:30 UTC on January 13, 2018, the satellite was commanded to Transponder Mode for the first time. Initial tests show the transponder functions very well. One testing station was able to access the satellite using 5 watts from an HT to a whip antenna from inside his house at approximately ten degrees of elevation. 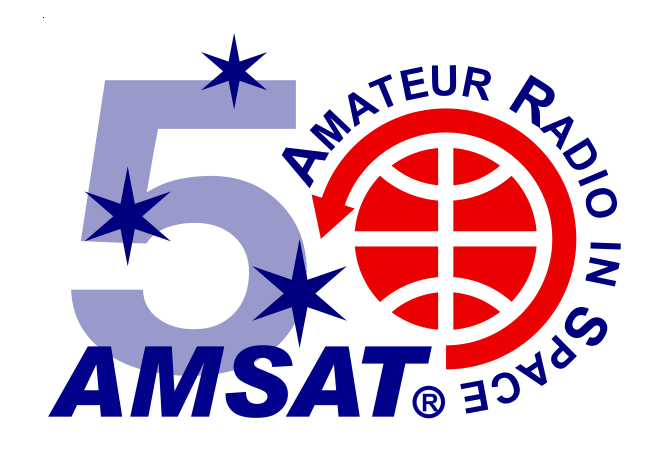 AMSAT Engineering reminds all amateur radio operators that, although the satellite may be found in Transponder Mode at times during the commissioning process, it is essential to not transmit to the satellite before it is opened for general use as you may interfere with various tests that need to be performed. The first image received from the Virginia Tech camera. AMSAT plans further testing of the Virginia Tech camera during the early hours of January 14, 2018 (UTC). If not shut off by a command station, the camera remains active for a period of 40 minutes following activation, so the active period may vary depending on when the camera is activated. 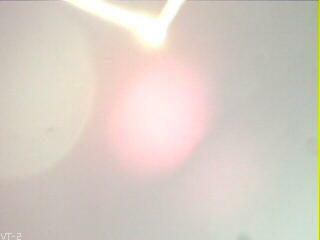 The first image of Earth received from the Virginia Tech camera. This should provide an opportunity for stations in areas including Russia, China, and Japan to receive pictures from the Virginia Tech camera. Please be sure that FoxTelem’s source is set to “Auto” so you will be able to receive either high-speed frames carrying camera payloads or data under voice (DUV) frames when the satellite is in Safe Mode or Transponder Mode. If using an external audio source for FoxTelem, be sure you are set for a minimum bandwidth of 20 kHz to receive the high-speed data. Thank you to all stations who have uploaded telemetry data to AMSAT servers. As of 18:00 UTC on January 13, 2018, a total of 90 unique stations have contributed telemetry from AO-92. Continued collection of telemetry data is essential to the commissioning process. AMSAT greatly appreciates the participation of the amateur radio community in collecting telemetry for the Fox-1 satellites. 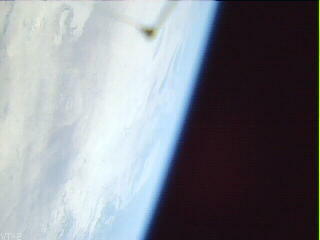 A view of the curvature of the Earth seen from the Virginia Tech camera. 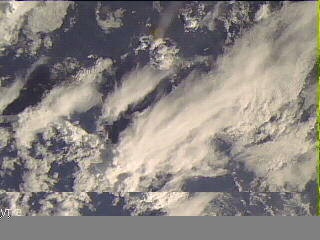 At the top of the image in the middle of the frame, you can see the tip of the satellite’s receive antenna and a piece of the line that held the antenna down prior to deployment.